Comments: Used IC-7600 HF-6M Transceiver SN 0203467 is in like new condition. Everything is in very good condition. 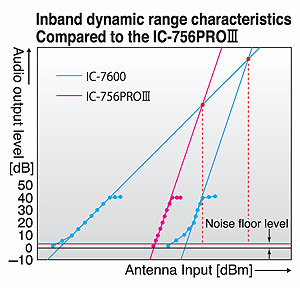 The latest DSP technologies developed for the IC-7800/7700 plus over 45 years of analog circuit expertise give the IC-7600 the performance advantage. The flagship's lineage: dual DSP units, 3kHz 1st (roofing) filter, double-conversion superheterodyne, all direct descendents of the IC-7800/7700. 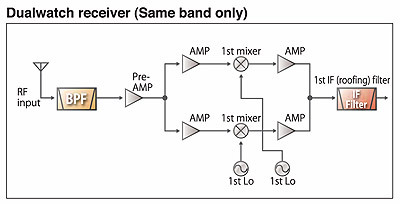 Dual DSP: Separate DSP units for transmitter/receiver and spectrum scope. Ist IF Filter: Three built-in 1st IF (roofing) filters – 3, 6 and 15 kHz. 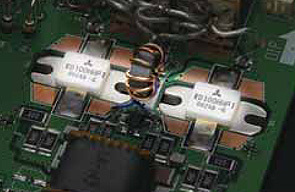 Receiver System: The double-conversion superheterodyne system and the image rejection mixer improve inband IMD. Display: 5.8-inch WQVGA (400×240 pixels)ultra-wide viewing angle TFT display with long-life LED backlighting. Spectrum Scope: High-resolution real-time spectrum scope using a dedicated DSP unit. USB Connectors: Easily connect keyboards, flash memory drives and PCs. PSK Operation: Built-in PSK and RTTY operation with a USB keyboard - PC not required. 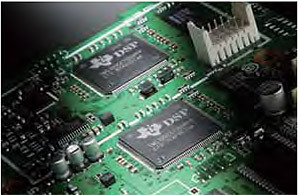 Two separate 32-bit DSP units power the transmitter/receiver and spectrum scope. These processors give the IC-7600 high performance comparable to our top-of-the-line IC-7800 and IC-7700, thanks to the combination of dual DSP and our analog RF design expertise. Icom's long years of analog RF circuit experience combined with the latest digital technology results in an astonishing 104dB receiver dynamic range and +30dBm IP3 in the HF bands without sacrificing receiver sensitivity. Even a weak signal adjacent to strong signals is clearly received by the IC-7600. The IC-7600 employs a double conversion superheterodyne system which has an image rejection mixer for the 2nd mixer stage. 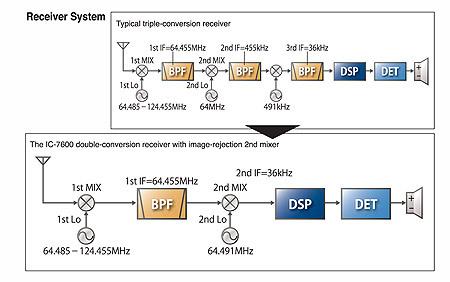 When compared to a typical triple-conversion system, the double conversion system is more difficult to implement but it dramatically reduces signal distortion and provides a high-fidelity RF signal to the DSP processor. The IC-7600 has dual AGC loops, one analog and one digital, both under DSP control. This architecture prevents strong adjacent signals from "pumping" the AGC and allows maximum dynamic range in the DSP. The IC-7600 has three built-in 1st IF filters ahead of the 1st IF amplifier stage. The 3kHz filter is especially effective in CW and SSB modes to eliminate overloading caused by strong signals just outside the passband. The IC-7600 DSP allows you to "build your own" digital IF filter. You can quickly choose bandwidth, shape factor and center frequency, so that you can work that rare DX station while your competition's still tweaking their transceiver controls. There filter memories allow you to change filter settings instantly, a great help during contesting or other high-rate operating. After "building your own" digital IF filter, you can use digital twin Passband Tuning (PBT) to shift and narrow the IF passband until the interference is gone and you can clearly hear that weak signal. Signals such as heterodynes and AM carriers can be eliminated with automatic notch filter technology, making interference from RF sources such as beat signals and RTTY signals a thing of the past. 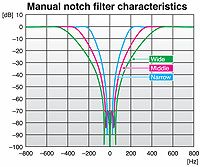 You can also choose three shape factors for the notch filter, to optimize interference rejection. T he processing power of the 32-bit DSP producers results you can hear! The 16-step variable noise reduction can significantly enhance the receiver's signal-to-noise ratio, giving you a clean, clear audio signal that may make the difference between making the contract or not. A 100-step digital noise blanker reduces interference from pulse-type noise sources such as engine ignition systems. The IC-7600 provides ±0.5ppm frequency stability using a high stability temperature-compensate crystal oscillator (0°C to +50°C). This high stability TXCO unit offers stable operation even during continuous transmission on RTTY or PSK31 mode. The IC-7600's ultra-wide viewing angle display has excellent color rendition and high contrast ratio with fast response time. These features allow the spectrum scope and simulated analog meters to move smoothly and naturally. While LED backlighting offers faster start-up; stable brightness and very long life. The dedicated spectrum scope DSP with built-in digital filtering greatly improves dynamic range, response team and frequency accuracy of the spectrum scope. The scope automatically selects the optimum resolution based on the sweep bandwidth. In addition, the spectrum scope range can be set independently from the receiving frequency. You can monitor band conditions between the selected sweep edges (Max. 500kHz) in the fixed mode, as well as sweep a selected bandwidth centered on the receiving frequency in the center mode. With digital voice memory, you can record the incoming signal and immediately replay the audio, a must-have feature for DXing and contesting. Because the transceiver is recording continuously, time-shhift playback can replay the 15 seconds of audio that you heard <before> you pushed the Rec button! The IC-7600 has a 4-channel transmit memory (maximum 90 seconds per channel) and 20 channel receive memory (maximum 30 seconds per channel, total 200 seconds with 20 channels). In addition, the recorded incoming signal can be saved on a USB flash drive. The multi-function meter allows you to observe the transmit/receive conditions at a glance. In addition to the signal strength, transmit power level, ALC, compression level and SWR meters, the IC-7600 shows the drain terminal voltage of the final amplifier (Vd), the drain current of the final amplifier (Id) and temperature of the PA circuit (TEMP). The digital RF compressor boosts average RF output power, improving signal strength and readability. The triple band stacking register quickly memorizes and calls up the operating frequency and mode for 3 channels on each band. Just push the band key button (ten-key pad), and you can call up the last operating frequency and mode. This function is convenient especially when switching bands during contests, etc. You can program the band edge not only according to the amateur radio band plan but also more specific frequencies like contest frequencies, CW operating mode, etc. If you try to operate on the OFF band, the transceiver alerts you with a beep sound. You can also inhibit transmitting in the OFF band. Built-in memory keyer provides 4 channels for CW mode and 8 channels each for RTTY and PSK31 modes, capable of storing up to 70 characters for each channel. The memory keyer is useful for sending CQ or exchanging numbers during contests. When not contesting, you can store and send your name, QTH, rig, etc, With a USB keyboard, you can send memory contents using function key on the keyboard. The IC-7600 has one USB connector on the front panel and one on the rear panel. You can connect a USB keyboard or USB flash drive to the front panel (type A plug) and connect a PC to the rear panel (type B plug). Using the CI-V data format and external software*, you can control the IC-7600 from a PC via the USB port. You can also transfer audio, both transmit and receive, via the USB port. The built-in audio equalizer has separate bass and treble adjustments for a total of 121 combinations, so you can adjust the tonal quality of your voice as you want. 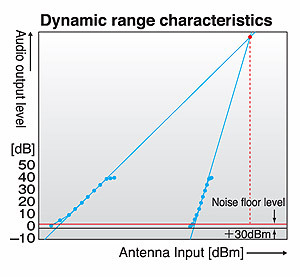 In addition, the transmit bandwidth is selectable from 100, 200, 300, 500Hz at the lowpass edge, and 2500, 2700, 2800, 2900Hz at the high-pass edge respectively. Three types of high and low combinations can be stored in the memory as favorite settings. With this flexibility of DSP-based waveform shaping, transmit audio quality is adjustable to your preference. High-power FET transistors, RD100HHF1, are used in the PA unit providing excellent signal quality and low IMD characteristics. With a large heat sink and cooling fans, reliable 100W output at high duty cycle can be used, for example in contesting or data modes. For amplifier keying (SEND jack), you can select either a mechanical relay (max. 16V/500mA) or a FET switch (max. 250V/200mA). The FET switch is designed to key older tube-type amplifiers that may have high voltage on the SEND line. the antenna tuner memorizes its settings based on your transmit frequency, so that it can rapidly tune when you change bands. High-voltage capacitors allow continuous-duty-cycle full-power operation.